All membership fields MUST BE COMPLETED with the accurate surfer information. If any fields are not completed accurately at the time of purchase, the surfer's membership WILL NOT be processed. The purchaser will receive an email to make the provide the accurate information and an additional $25.00 processing fee will be charged. I Agree To the License Agreement. I have read and accepted this release of liability and assumption of risk agreement, fully understand it's terms, understand that I have given up substantial rights by agreeing to it. Additionally, by clicking this box I agree to be bound by the terms of the NSSA Hold Harmless Form and am doing so voluntarily without any inducement. In the fields on this page, please complete the NSSA Member information. It is critical that this information is complete and accurate so that our records are correct. As stated previously, if you are a parent registering more than one child, please complete the entire process for each NSSA Membership. 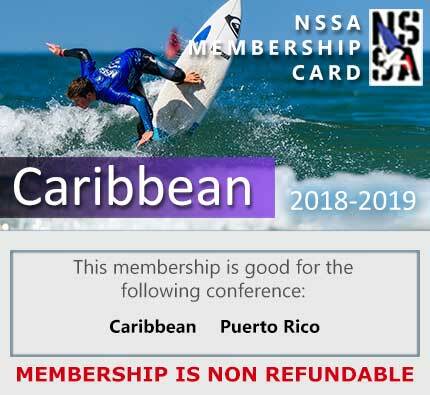 If you are new to the conference you will be surfing in or need additional information regarding conference events, please consult the NSSA Director in the conference you will be competing in. Contact information for all NSSA directors is located on the NSSA website under the menu button “CONTACT US”..
You can only register for one NSSA Membership at a time. If you are a parent registering more than one child, this process is for each NSSA Membership. If you are new to the conference you will be surfing in or need additional information regarding conference events, please consult the NSSA Director in the conference you will be competing in. © 2018-19 National Scholastic Surfing Association. Keeping the dream alive.